How Young Is Too Young to Go to School? This story is part of a series on 2-year-olds produced by the Hechinger Report and the Teacher Project, nonprofit news organizations focused on education coverage, in partnership with Slate magazine. PARIS—Abdelali Kerrach has eagerly awaited the day his younger daughter can start school since just about the day she was born. That’s because he wants her to get a strong—and notably early—start to her education at École Albert Camus, a small, friendly building near his home in the Parisian suburb of Trappes. A few years ago, Kerrach, a Moroccan immigrant, enrolled his older daughter there as a 2-year-old. Kerrach now credits that early beginning with helping the girl become a stronger, more disciplined student as she progresses through her “école maternelle,” as school is known for children ages 6 and younger in France. “I’m afraid of her not succeeding in school,” said Kerrach, of his older daughter; he adds that his wife speaks Moroccan Arabic, not French, to the girls at home. (Like most of the people interviewed for this article, Kerrach spoke to me in French, through a translator.) An early start is “a real answer to the question of school success,” particularly for families where French is not the first language, Kerrach added. In a growing number of communities across France, officials agree. In recent years, the country has decided that boosting the number of 2-year-olds enrolled in école maternelle—with a particular eye toward struggling families who live in the equivalent of U.S. public housing or come from immigrant communities—is one of the surest paths to promoting educational equity. 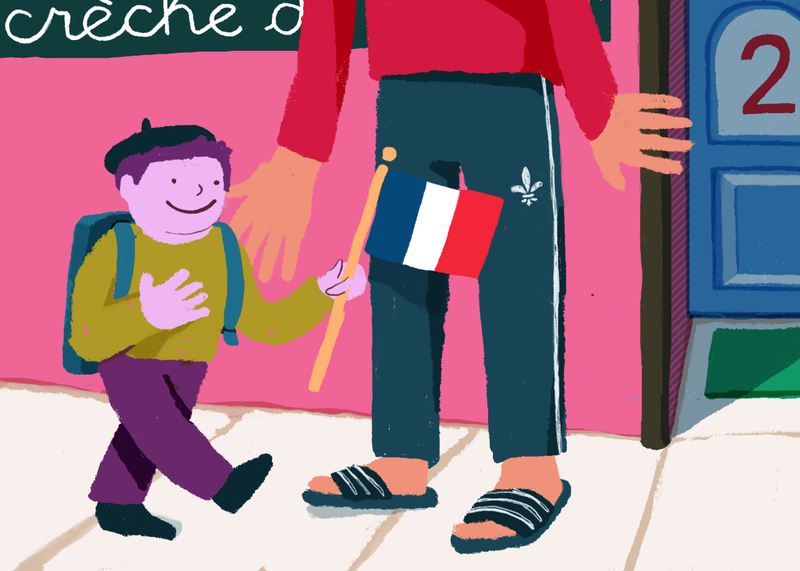 In France, nearly all youngsters already start school at the age of 3, so the latest shift is really about moving up the starting line by a year for the kids who need it the most. “We prefer to give an advantage to the most deprived children,” said Gilles Pétreault, an expert in early childhood education whose official title is general inspector of state education for the France Ministry of National Education. In the United States, by contrast, the percentage of 2-year-olds enrolled in educationally focused preschool programs is negligible, and about a third of American 3-year-olds attend such programs (nearly 100 percent of French 3-year-olds do). France may be able to provide more government-based care to its toddlers, but it still grapples with many of the same challenges and questions that plague early childhood education in American cities and states, including debate over the best age for young children to start school; how to train a workforce of qualified educators to manage the smallest pupils; and how, with limited resources, to ensure that existing programs target the children who need them the most. I chose to focus on France’s burgeoning new programs for 2-year-olds not because the country has solved the riddle of early childhood care and education; indeed it lags behind Denmark and some other Scandinavian countries when it comes to both access and addressing inequality. But the country is much further along than the United States, particularly when it comes to 2- and 3-year-olds, and it provides a more accessible, realistic model for American cities and states that are actively trying to strengthen their early childhood offerings, including New York City, Boston, Delaware, and Colorado. American 2-year-olds may never eat three-course meals of ratatouille, whitefish, fresh bread, and fruit with knives and forks, like the classroom of French 2- and 3-year-olds I observed. But there’s no reason that, with a modest amount of additional resources, collaboration, and commitment, we couldn’t create more programs for our toddlers akin to those that are slowly proliferating across France. Bernadette Hamarat was amazed a year and a half ago to learn that the école maternelle close to her home, located in a suburb of the southern, river city of Bordeaux, would enroll children as young as 2—regardless of whether they spoke a word of French, or even knew how to use the toilet. Hamarat, whose husband is Turkish, was nervous initially about sending her son, Lucas, off to school by himself (Lucas speaks Turkish at home). But she hung around the classroom for the first few days and felt comforted by the warmth of the teachers, the cleanliness of the classroom, and the emphasis on language instruction, so in the fall of 2016, at the tender age of 2, Lucas started attending school five mornings a week. By the time I visited in June, Lucas had been attending school for several months and Hamarat said he had mastered basic words like come, wait, please, and thank you, and had grown much more self-sufficient. “It’s a pity that there are not enough classrooms for all 2-year-olds,” said Hamarat. Two-year-old enrollment was also a priority for the French government in the 1990s, although the effort was abandoned in the 2000s. And the French government has no plans to rapidly scale its new school-based programming for 2-year-olds. Instead it is relying on slow growth through the cooperation of officials like Léonhardt and programs that still tend to be half, not full, day. From the start, the French government knew that it could not feasibly reach all or even most 2-year-olds anytime soon, so instead it decided to take incremental steps that over time might add up to something more sweeping. Education officials decided to focus on the priority areas not only because the children there were less likely to learn French at home, but because they also knew that in many parts of France, low-income and immigrant families have less access to the country’s highly regarded crèche programs: government-run day care programs that enroll children as young as just a couple of months and operate on a sliding scale so that poor families pay only a minimal fee. At first, I feared the new 2-year-old classrooms represented a form of coerced acculturation for immigrant families: pulling young children out of their home environments as early as possible to inundate them with French language, French customs, French mores. And indeed, the language (and, of course, culinary) component is a critical part of the program, with not only the toddlers but any non-French-speaking parents encouraged to learn the language of Proust and Voltaire as quickly as possible. But when I observed the practice on the ground, the teachers in the 2-year-old classrooms seemed to value highly the linguistic and cultural diversity represented in their classrooms, and parents were a more welcome addition to the school’s daily activities than they are in many American schools targeted at low-income and immigrant communities that I have visited. “We work together and we recognize the knowledge of the parents,” said Djida Lambert, the lead teacher in the 2-year-old classroom at the school in Sainte-Geneviève-des-Bois, noting that she incorporates nursery rhymes from her students’ native countries, including Mauritania, Turkey, Pakistan, Cambodia, and several others. On the morning that I visited, several mothers from different African countries sat in the parent meeting room, stitching feathers onto brightly colored fabrics for children’s costumes—designs inspired by song and dance performances in their home countries. The parents passed around homemade Middle Eastern snacks one mother had brought. One upcoming challenge for the expanding 2-year-old programs will be to reach the families who most need the extra support, even as more parents grow more aware of the programs’ existence, and slots—like those in the crèches—become more coveted. Like the highest-performing charter schools in different U.S. cities, the 2-year-old classrooms could be at risk of attracting a self-selecting pool of more motivated and savvy parents, like Kerrach, who understand the advantages that an early start to school can bring. When I asked about this, local officials in the Parisian suburbs said they are convinced they are reaching the most disconnected families through a combination of newspaper advertisements, informal networking, and referrals from social service and medical personnel. Indeed, Hamarat heard about the 2-year-old program through a social service agency; Nawal Kadizi, a Moroccan immigrant, got word through a friend; Dieganayaguy Kalaiarasi, a mother from Pondicherry, India, learned of the new classroom from officials in the municipality; and Ali Kerrach saw an ad in the local newspaper. I wondered, though, about one official’s comment that when the 2-year-old classrooms are oversubscribed, prospective parents must give a presentation before a panel as to how their child could benefit—a hurdle that seemed like it could easily bias the process in favor of the bureaucratically savvy and self-possessed. The schools I visited seemed genuinely eager to reach the neediest families with their new 2-year-old classrooms, but whether they can successfully execute on that desire remains a core challenge of just about any poverty alleviation effort anywhere that targets the most vulnerable. Most classrooms for 2-year-olds do not really resemble what we think of as “school.” Like many preschools in the United States, the classrooms in the French écoles maternelles that I visited featured not rows of tiny desks and chairs, but a variety of “centers” with (mostly) educationally enriching games and activities for the children to play: containers with dried beans or rice to scoop into different size buckets, Legos to fashion into sculptures, a reading center with children’s books and photo albums the kids put together themselves, a mini indoor playground with tree stumps and branches for the students to sit and explore. The toddlers learn largely through play—gaining vocabulary as they describe the photos in their albums to classmates and teachers, and motor skills as they fashion clay into different shapes. The 2-year-old classrooms offered a stark contrast to one 5-year-old classroom I poked my head in down the hall, where children sat at desks in rows and were engaged in much more rote, traditional academic instruction. Yet the proliferation of classroom-based learning for kids this young has still concerned some early childhood experts in France who say that 2 is simply too early for children to start school. In fact, there is a lack of consensus around what age is most suitable for youngsters to enter traditional school environments, and the answer depends largely on context: how “developmentally appropriate” and thoughtful the preschool classrooms are, in terms of pedagogical approach; staff-to-child ratio; and classroom environment. What we do definitively know is that in America the test score achievement gap between low-income children and their wealthier peers correlates closely with inequities youngsters experience before they even start school. That makes it all the more urgent that we work to get disadvantaged toddlers access to safe, healthy, educationally stimulating environments—whether in child care centers or school buildings. Nathalie Vaillant, a psychologist who helps train early childhood workers, including at Paris-area crèches, thinks 2 is simply too young for school. “I don’t think the teachers are trained enough to know how to work with 2-year-old children.” Vaillant said she particularly worries that not all écoles maternelles have the resources to keep the staff-to-child ratio low enough in the 2-year-old classrooms to provide sufficient individual nurturing and attention. “Two-year-olds still need to be held in the arms,” she said. “They need to be cuddled.” In crèches, the maximum ratio is five infants or eight toddlers per adult. Based on my on-the-ground observation, the answer to where 2-year-olds can best be served depends almost entirely on implementation: The crèche system could be strengthened if its workers received more extensive training in early childhood education and development and earned commensurately higher pay. Meanwhile, schools serving 2-year-olds need to remain vigilant about keeping staff-to-student ratios low. (The programs I visited all relied on supplementary funding to add extra staff in the 2-year-old classes for additional support.) They also need to ensure that the more regimented approaches of the older grade levels don’t seep into the toddler classrooms. In France, officials agree that training opportunities for the growing fleet of 2-year-old classroom teachers could be significantly expanded and customized to the age. If there’s a lesson for the United States from the research and on-the-ground observation of the French experience, it’s that 2 is not too young for children to enter the school building, but it is too young for them to start “school”—imposing the norms, structures, and expectations of even 3- and 4-year-old classrooms on 2-year-olds is a mistake. While 2-year-olds are capable of learning a great deal, they are also still very much babies. The new French 2-year-old classrooms are not dissimilar to smaller efforts in the United States to reach the most financially disadvantaged preschoolers through programs like Educare, which relies on a combination of private and public funds to help youngsters start traditional school on a more equal footing. A key difference, however, is that in France, the government, both national and local, is leading, and funding, the charge. The France effort might be a work in progress, but at least officials there have recognized that better serving and educating 2-year-olds—starting with the ones who have the least access to quality out-of-home care—are crucial steps toward promoting educational equality more broadly. It’s a fact that continues to elude most American leaders with the power and resources to enact change.